How do you tell the story of something as horrific as Pol Pot and the Khmer Rouge’s four-year rule over Cambodia after the Kampuchean Revolution when the only footage shot was that distributed by the regime itself? This is the problem director Rithy Panh faced, a teenager when war hit to disperse the citizens of Phnom Penh into work camps so they could build a newly “freed” land. He witnessed the atrocities and lived through the famine as party leaders and their dogs ate, watching those who dared steal an extra ear of corn killed without remorse. He heard his father’s refusal to “eat like an animal”, dying instead of self-imposed hunger to instill the concept of free will beyond the Angkars’ false ideology. His siblings were taken and his mother died just before returning with stolen fish to feed her. Decades later his country still rebuilds in the wake of Pot’s ill-fated 1970s desire for agricultural reform that ended up cleansing a nation of its poor and helpless—men and women stripped of their identity and made to wear black-dyed clothes while laboring for an allowance of a Nestle tin full of rice. Panh knows the Khmers filmed their executions; knows such imagery of this genocide by both neglect and torture existed and yet cannot find a single frame. So he must ask whether the truth lies in his memories or the archived films of Pol Pot carrying his fan and clapping with a giant smile on his face while Cambodians harvest grain in the fields with calm determination. If we cannot see him digging mass graves next to a school turned extermination center, did he? 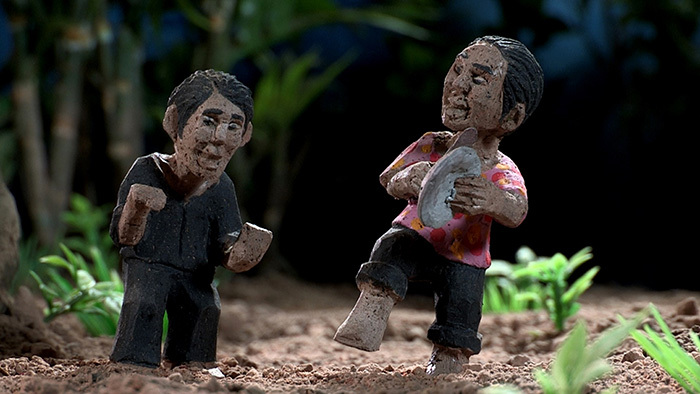 This is the L’image manquante [The Missing Picture] of his documentary’s title—the film itself becoming the document he survived to share. As the French narration from Randal Douc explains, Panh knows there are things no person should ever see and when they do they’ll wish they could die. But as someone who saw it with his own eyes—the worm infested joints of fellow prisoners or the tear-streaked face of a mother given to guards as a criminal by her own son—it’s his responsibility to tell the world. 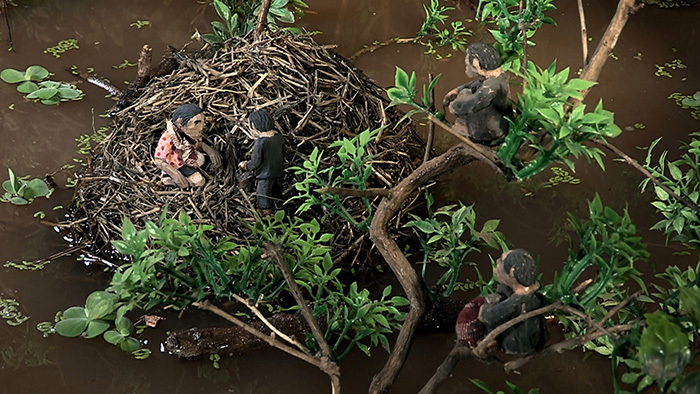 If the picture he seeks is missing, he will create one of his own by filming the miniature sculptures of Sarith Mang. These static recreations of the memories he cannot shake providing us a first-hand account of events history has failed to preserve until now. And what an ingenious way to show us it is. I hear the name Pol Pot and think monster, but I couldn’t tell you what he did or why. That simply wasn’t something my 90s education taught when stories of the Holocaust were more palatable/relatable. Panh has therefore taken it upon himself to be the orator that sets the record straight about a group of Communist revolutionaries who mostly lived happy and fruitful lives after being granted amnesty by the reinstated monarchy in 1994. He explains why so many joined the Khmers—American bombings helping feed the lust for change like usual; why everything they said turned out to be a lie in order to enslave a nation; and how their ideal Cambodia was one devoid of people littering the land they’ve strived to transform. We listen to his stories of pain and suffering while looking at hand carved maquettes painted in uniform black with fatigued, forlorn faces of defeat. He tells us what he knows and what he’s seen fully cognizant it proves nothing. Even if he found a photograph of an execution, no one has to believe it was anything more than an isolated instance. Panh accepts his role as a storyteller, calls his film a quest only cinema can provide through artistic minds and brave survivors. He used to visit film sets before the revolution, escorted by a director neighbor to catch the colors, costumes, and dancing that all went away under Pol Pot’s rule. 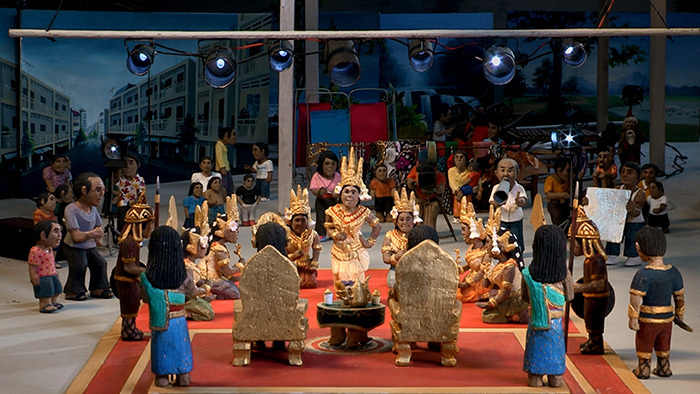 He’s experienced both eras of Cambodian lifestyle and we allow his interpretation of it to stand as truth until something either corroborates or denies it. 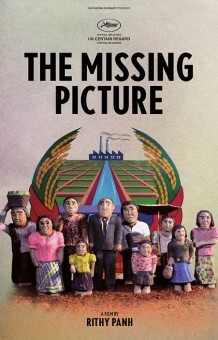 The Missing Picture opens in limited release on Wednesday, March 19th.